This Olive chemo cap for men combines the comfort of a hat with the rugged, masculine style of a cap. Thise cap, which have a flexible visor, will keep your head pleasantly warm and feel so soft that you can easily wear them from morning till night. An exclusive design without scratchy stitching or elastic. Also suitable for women who prefer a sportier style! The panel in the visor of this chemo cap is soft and flexible. Even if you are lying down, this cap still feels comfortable. No scratchiness, no tightness. 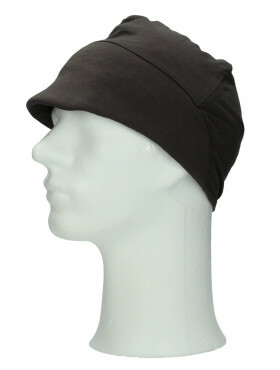 ADVANTAGE: no elastic and no annoying seams or stitching in the hat avoiding irritation to your already sensitive scalp. Standard size. Made of high-quality stretch viscose. This airy, breathable fabric guarantees the right temperature inside and out and optimum wearing comfort. Also for women looking for a no-nonsense style!